Basically (as much as the Memorymoog can be considered basic) this instrument is 6 Minimoogs in one box that will store 100 programmed patches. Its chief designers were Rich Walborn and Ray Caster of the Norlin-acquired, "Bob Moog"-less Moog Music. Each voice has 3 VCOs, with tuning controls for VCO2 and VCO3. 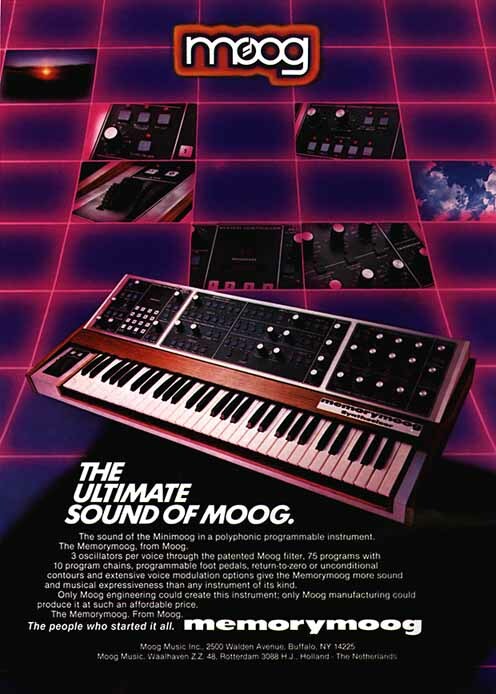 Unlike the Minimoog, the Memorymoog used Curtis 3340 chips as opposed to the Moog oscillators. Each oscillator can be set on pulse, saw, or triangle (or any combination of the three). And, like the Minimoog, the VCO3 can be used as an LFO to modulate the pitch of VCO1 and VCO2. But unlike the Minimoog, VCO2 can be synced to VCO1. Also, unlike the Minimoog, you have a separate LFO that controlls all of the voices. The LFO is switchable between triangle, pulse, positive and negative sine wave, square wave, and sample-and-hold. Each voice also has its own 24dB/octave filter which has variable keyboard tracking, switchable between 1, 1/3, and 2/3. The Memorymoog can also be set on unison mode which makes it a mono synth using all 18 oscillators for one note! In this mode you can switch between lowest, highest and last note priority as well as single or multiple triggering.